Today, we are living in disease-prone world. So, it has become extremely important for us to protect ourselves and our family from deadly diseases. The best way to keep the diseases away is to follow a healthy lifestyle. A healthy lifestyle is not just eating nutritional food, but also to live in a clean and germ-free environment. The need for personal hygiene is increasing everyday with the spread of contagious diseases like swine flu. So, it is better to keep things clean both in office and at home. Although, you can clean the floor, wall, table, and chair with water, it is definitely not possible for you to clean electronic devices with water. So, the chances for germs getting multiplied in them are very high. Have you ever thought of washing your keyboard or mouse with water? It may sound ridiculous. But, this is certainly possible with the invention of the washable keyboard. You may wonder what would be the necessity for a washable keyboard. The answer is very simple. This keyboard will help you protect yourself from bacteria. Recently, an article by Infection Control Today, August 2007 edition, says that "The keyboards used in the hospital are the main cause of infection. Bacteria have a tendency to live and grow on keyboards for nearly 24 hours and thereby spreading the dreadful infections all around". Do bacteria really proliferate in a keyboard? Yes, it will. In a standard keyboard the bacteria grows underneath and in-between keys. It is not possible for you to clean them with water. To overcome the effect of infectious bacteria developed and spread from keyboards, Tupelo Super Store offers you the Silver Seal Antimicrobial Keyboard. This washable keyboard is made from Silver Seal antimicrobial plastic, which offers complete resistance against surface bacteria. 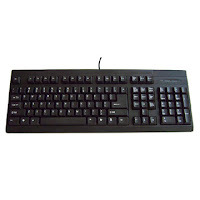 The Silver Seal Antimicrobial Keyboard prevents the growth and spreading of harmful bacteria. It provides absolute protection against cross-contamination. You can easily clean this computer keyboard with water. The Silver Seal Antimicrobial Keyboard's laser-etched keys will not get faded away by washing. Tupelo Super Store also offers you the Silver Seal Antimicrobial Mouse to complement the keyboard. Not just for hospitals, this washable keyboard and mouse are ideal for schools, labs, and more.